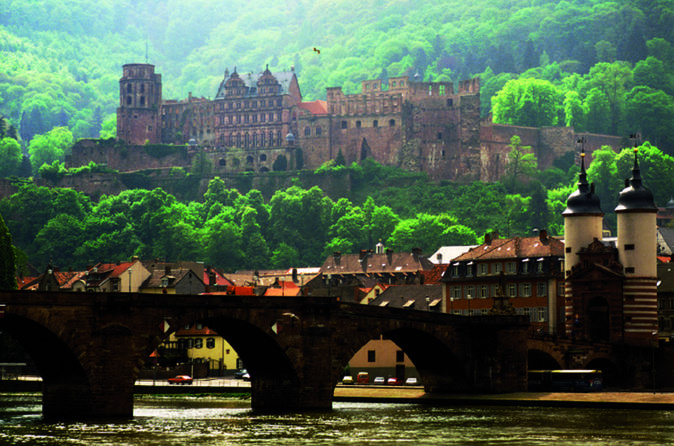 Visit the romantic city of Heidelberg on a half-day trip from Frankfurt. 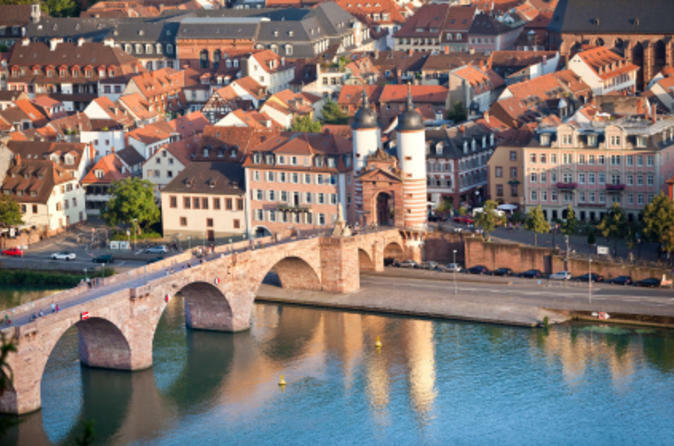 With an expert guide to show you around, you'll explore the ruins at Heidelberg Castle and discover the city's Old Town, home to Renaissance period buildings, the Karl Theodor Bridge and Heidelberg University. 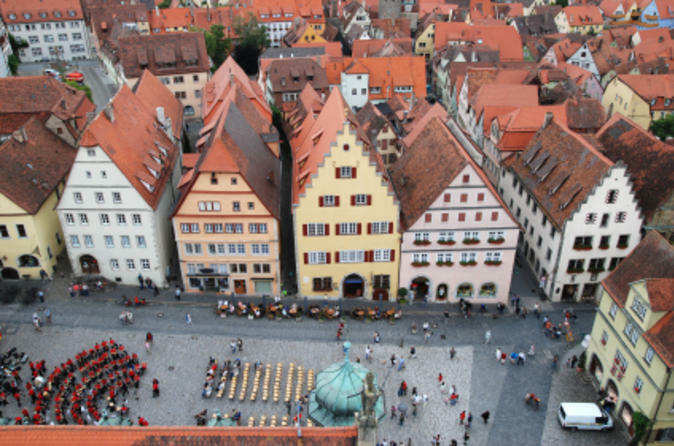 See two countries in one day on your Black Forest and Strasbourg day trip from Frankfurt! 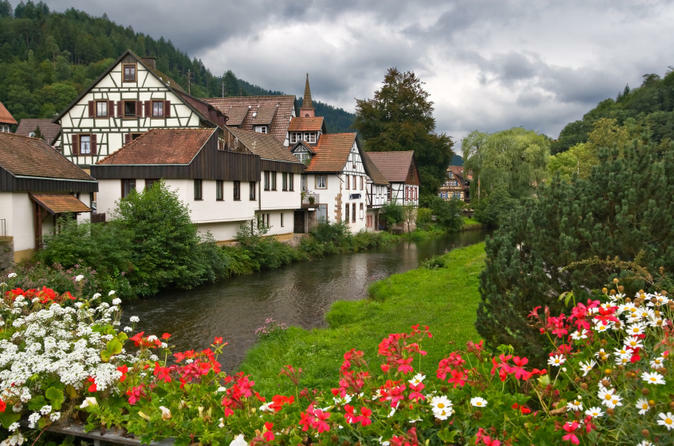 Traveling by luxury coach, you'll visit the spa town of Baden-Baden in Germany's Black Forest and the continental city of Strasbourg in Alsace, France. With an expert guide on hand and dedicated time for independent sightseeing, this day trip is a must-do for anyone wishing to explore parts of both Germany and France while in Europe. 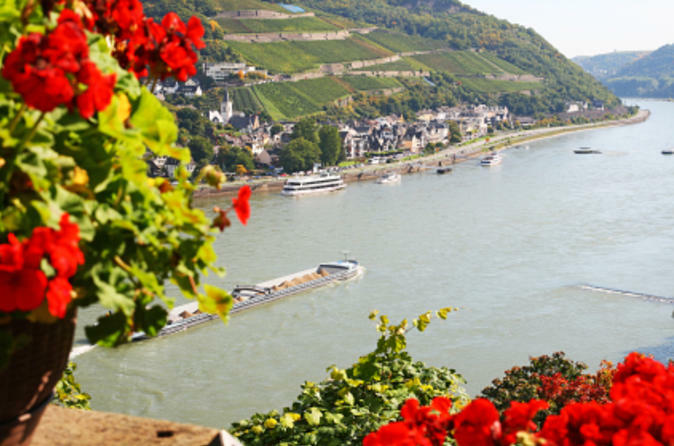 Experience the highlights of Frankfurt and the surrounding Rhine Valley in one day by combining two best-selling tours at a discounted price. In the morning, take a Frankfurt sightseeing tour by double-decker bus to see the Romer town hall, St Paul's Church, Frankfurt Cathedral, Goethe House, Hauptwache plaza and the European banking center. 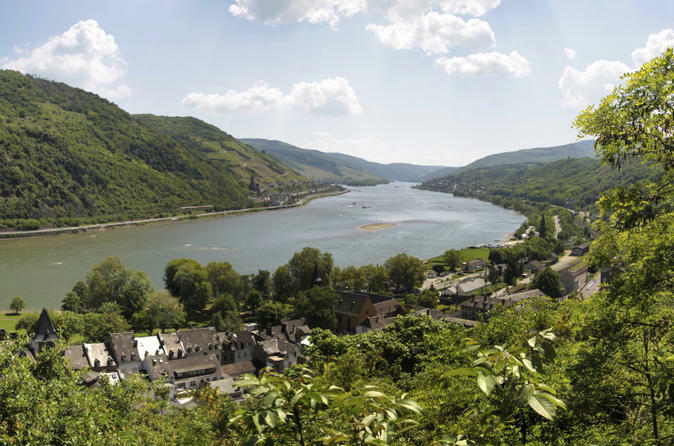 Then, hit the road for a day trip to the UNESCO World Heritage-listed Rhine Valley, where you'll take a lovely Rhine River cruise, have lunch at a riverside restaurant, and enjoy some wine tasting in the beautiful German countryside. Visit two of Germany’s most famous attractions in one day with this Frankfurt Super Saver, combining two best-selling tours at a discounted price. 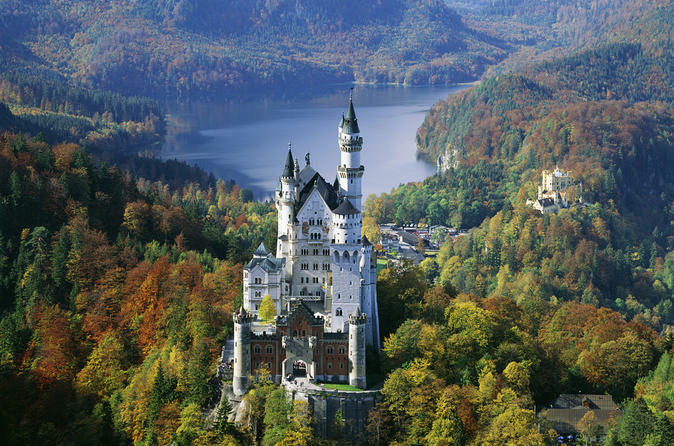 First, venture into the Bavarian hills to visit Neuschwanstein Castle, a stunning fairy tale–like palace that inspired Disney’s ‘Sleeping Beauty’ — and this tour lets your group skip the entrance lines. Then head to Rothenburg ob der Tabuer for a walking tour around one of Germany’s best-preserved medieval villages. Throughout this full-day tour, enjoy comfortable coach transport with a mix of walking tours and free time to explore at your leisure. Visit the beautiful spa town of Baden-Baden and explore the scenic woods of Germany's Black Forest on a day trip from Frankfurt. 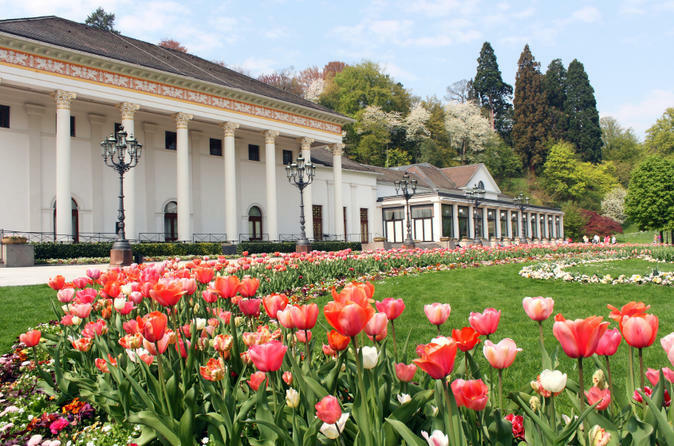 Head to Baden-Baden where you join a guided visit of the charming Baden-Baden Kurhaus Casino. Elegant and sophisticated, Baden-Baden offers a delightful townscape of tree-lined avenues, grand buildings and boutiques alongside its legendary thermal baths. Afterwards, enjoy a relaxing drive through the picturesque Black Forest and visit the legendary Lake Mummelsee. 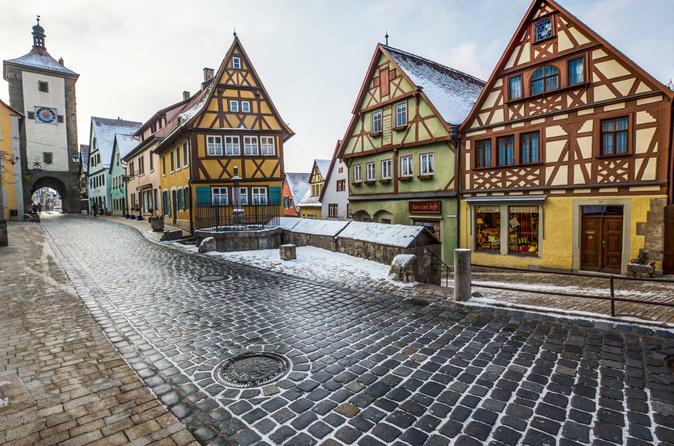 Visit Rothenburg ob der Tabuer in the Franconia region of Germany on a full-day trip from Frankfurt. 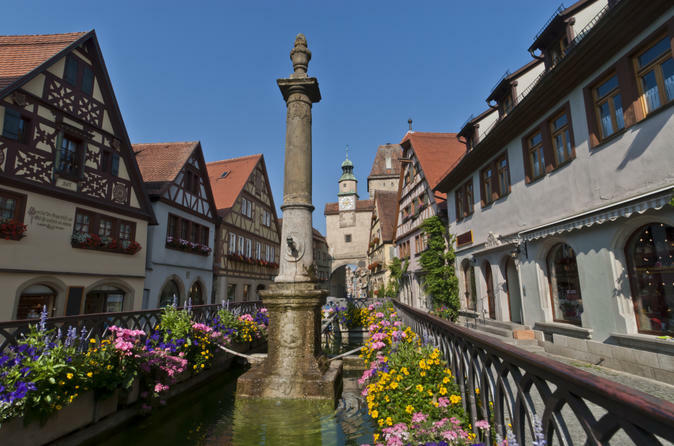 Accompanied by an expert guide, you'll take a guided Rothenburg walking tour to see the best of this beautiful medieval town. Entrance fees to either St Jacob's Church or Rothenburg's Medieval Crime Museum are included, and you'll have time to explore one of them independently after your guided tour. Explore the medieval cities of Heidelberg and Rothenburg ob der Tauber on a day trip from Frankfurt! Traveling with an expert guide, you’ll learn about the history and culture of both cities during a mix of walking tours and free time. Walk through the ruins of Heidelberg Castle, see charming half-timbered houses and well-preserved city walls in Rothenburg, and then visit St Jacob’s Church, a 500-year-old place of worship. Join this 7-day European highlights tour starting with the best of Prague. Look out for Bratislava Castle and St. Martin’s Cathedral as you continue your journey to Budapest where you will be able to explore the historical sites in Buda and Pest. Also enjoy sightseeing in Vienna, Salzbury, Mt. Titlis, Lurcene, Zurich, Rhine Falls, Lake Titisee and see the famous Black Forest. 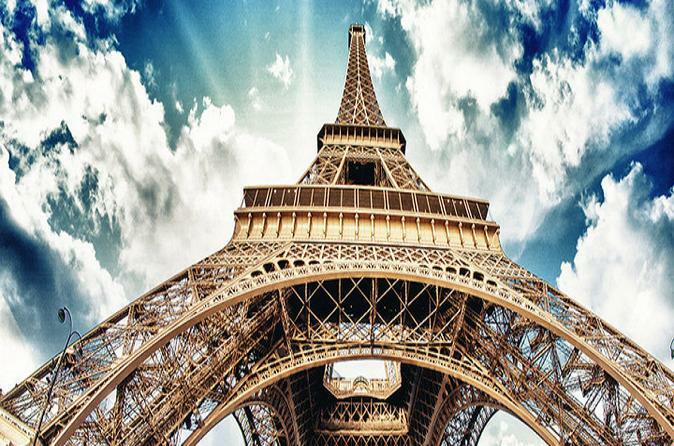 Get a comprehensive overview of some of the most beautiful cities in Europe in just 7 days. Follow the footsteps of medieval lords and aristocrats on a tour of Eltz Castle, and then enjoy dinner on the banks of the Rhine! This must-do day trip from Frankfurt introduces you to one of Germany’s best-preserved fortresses, showcasing impeccable rooms that have been left unchanged for centuries. Explore the armory room, kitchens and bedrooms while learning about the castle in its 12th-century heyday, and then relax with a dinner at a restaurant on the River Rhine. Numbers are limited to 14 on this small-group tour, ensuring you'll see all the sights with personalized attention from a guide. Enjoy an exciting sightseeing cruise along Frankfurt's Main River with the largest and most modern shipping company in the state of Hesse. 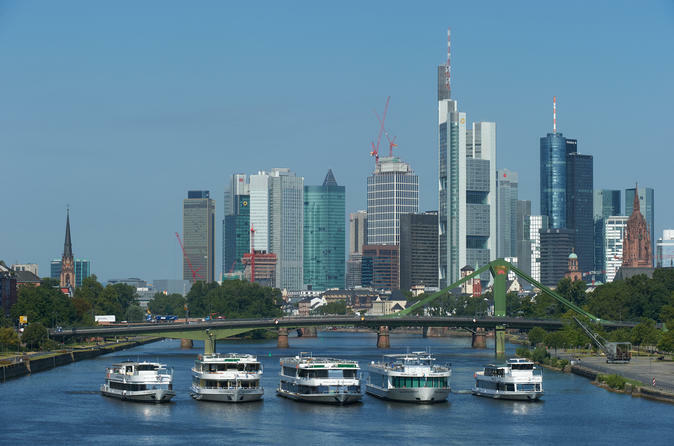 Discover the impressive skyline of Germany's banking metropolis from the water and cruise the Main River between Gerbermühle (Offenbach) and Frankfurt-Griesheim on a 100-minute tour that departs from Eiserner Steg (Mainkai) in Frankfurt. 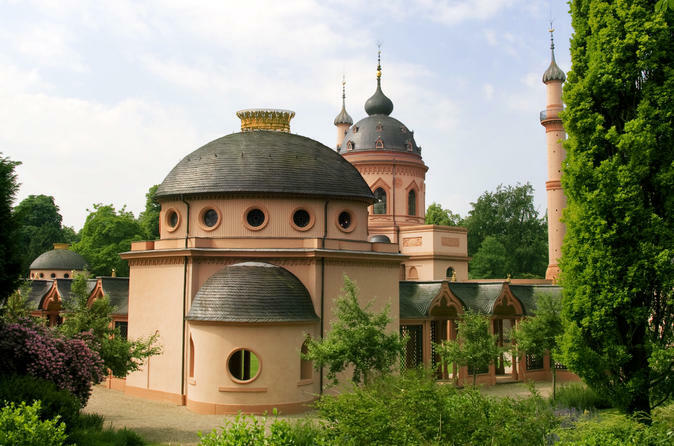 Explore the romantic side of Germany on this 7-day tour from Frankfurt. See some of Germany's historical and scenic treasures along the Romantic Road, including picturesque landscapes, charming villages, centuries-old towns and enchanting palaces. You'll explore Rothenburg ob der Tauber, visit the famous Neuschwanstein Castle, cruise on the Rhine River and marvel at UNESCO World Heritage Sites. Discover local traditions and enjoy culinary specialties of romantic Germany while all the details are arranged for you: your hotel accommodation (with breakfast), transfers, guided tours and much more! Visit the cities of Heidelberg and Nuremberg, two historical highlights of Germany, on a day trip from Frankfurt. The charming cities are rich with history and sights, and a guide will show off their best bits during walking tours. Visit the ruins of Heidelberg Castle; see sights like the Church of the Holy Spirit; and then learn about Nuremberg’s history on a stroll around its Old Town. Visit Heidelberg and the Black Forest town of Baden-Baden on a day trip from Frankfurt, led by an expert local guide! 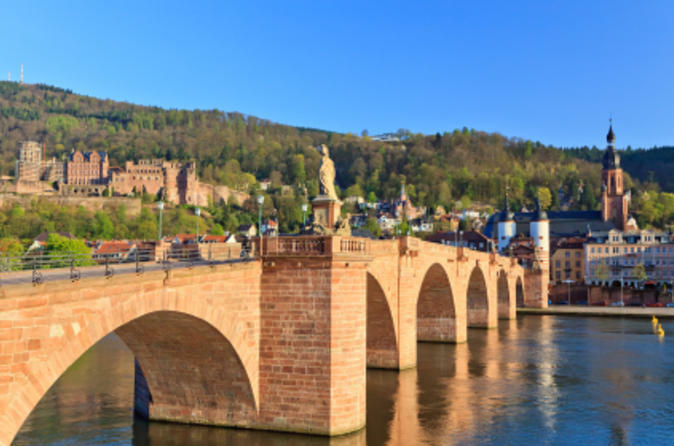 After walking around the ruins of Heidelberg Castle, explore the city’s Old Town on a tour, learning about its culture and sights. Spend your afternoon in the beautiful Black Forest, visiting the chic spa town of Baden-Baden, Lake Mummelsee and a town that’s famous for its production of traditional German cuckoo clocks. 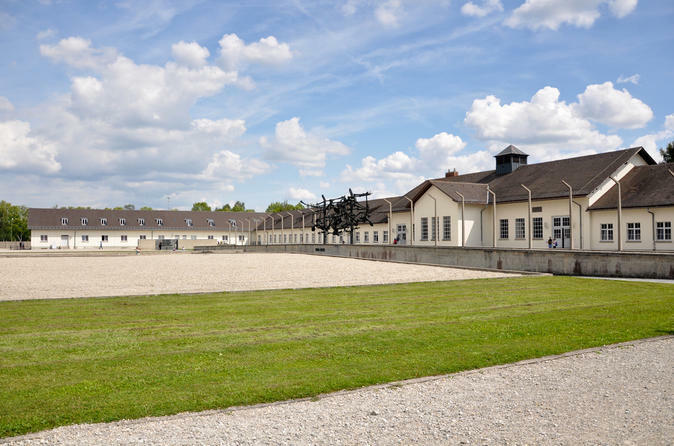 Learn about Munich's most important landmarks, including the nearby Dachau concentration camp, on this day trip from Frankfurt. Your day begins at Germany’s first Nazi concentration camp, where your expert guide provides important historical context to the bunkers, gas chambers, and other sights you see. Afterward, explore another side of German history with a comprehensive overview of Munich's famous attractions such as the Cathedral of Our Blessed Lady (Frauenkirche), Hofbräuhaus am Platzl beer hall, Old Town Hall at Marienplatz, and Viktualienmarkt. 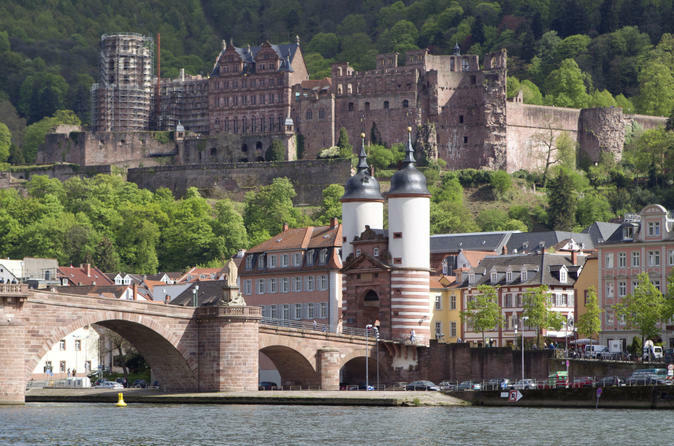 Visit one of the most beautiful cities in Germany on this 6-hour private tour from Frankfurt. 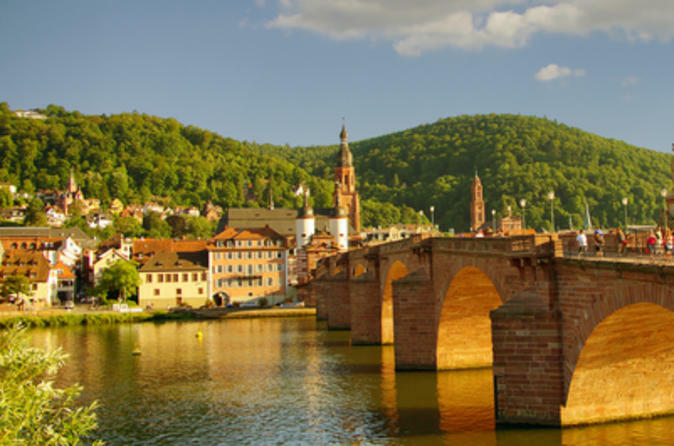 With an expert guide and private, air-conditioned transport, enjoy a scenic journey from Frankfurt to the romantic city of Heidelberg. Explore the haunting ruins of Gothic Heidelberg Castle, see the world’s largest wine barrel and marvel at the historical delights and pretty Renaissance architecture in Heidelberg Altstadt (Old Town). This sightseeing tour ensures you’ll see the best of the city while receiving undivided attention from a private guide. Between Koblenz and Bingen, 20 castles stand lined up on both sides of the river. The best way to admire them is from on board the cruise ship, where you can hop on and off all day at 19 different stops and enjoy the riverside scenery with more than 150 possible departure times. 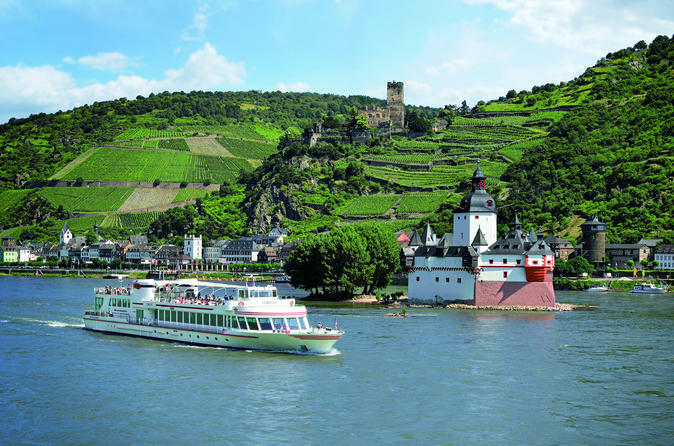 You can spend as much or as little time as you would like at each stop, with the Rhine Pass being valid on all scheduled day cruises between Cologne to Linz and Koblenz to Mainz. There is a restaurant on board but food and drink is not included with the pass. 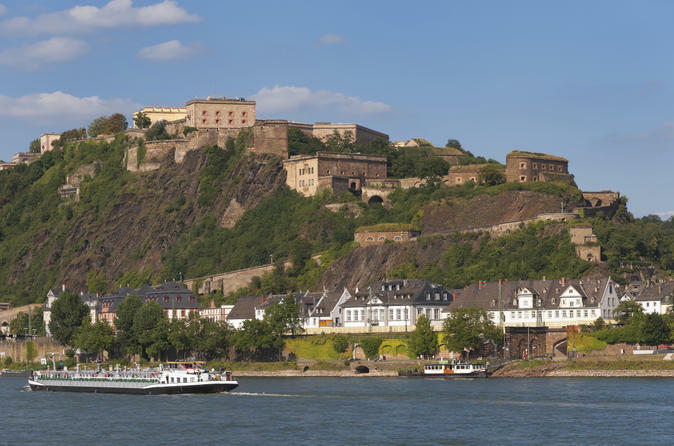 Graced with a stunning location on the confluence of the Rhine River and Moselle River, the historic city of Koblenz makes for a wonderful day trip from Frankfurt. Highlights on this small-group tour include a guided visit to Ehrenbreitstein Fortress, Europe’s second-largest preserved fortress, and a cable car ride over the UNESCO-listed Rhine Gorge. Enjoy free time to explore Koblenz at your leisure, and top off your experience with a typical German dinner on the banks of the Rhine. Numbers are limited to 7 on this small-group tour, ensuring you’ll receive personalized attention from your guide. 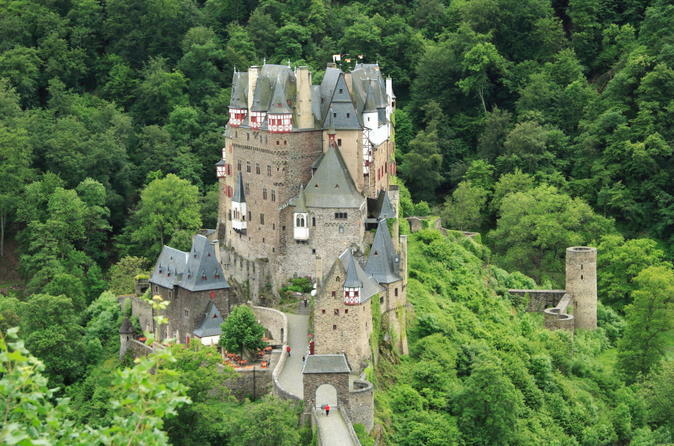 Visit two German castles in one day on this must-do day trip from Frankfurt! With a tour of Heidelberg Castle and the city’s Old Town included plus a visit to Schwetzingen Castle, the day trip is the perfect excursion for lovers of history, architecture and scenery alike. Take the scenic route back to Frankfurt, traveling along the German Wine Road and admiring idyllic scenery and picturesque towns like Neustadt. Spend a day in the must-see Bavarian cities of Munich and Nuremberg on this Super Saver from Frankfurt, and save money, too! In the morning, visit top Munich attractions including Marienplatz, Viktualienmarkt, Olympic Park, and the Cathedral Church of Our Lady (Frauenkirche). 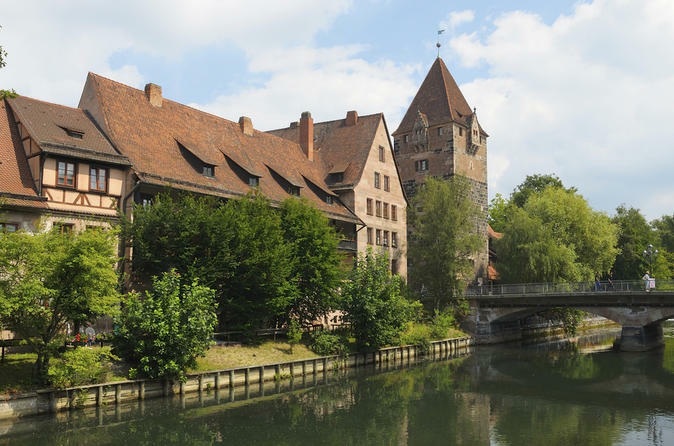 Then, spend the afternoon in Nuremberg, a center of European trade during the Middle Ages and site of World War II's infamous Nuremberg Trials. Experience a live escape from the room game, you will be trapped in a room with only 60 minutes to find the way out. If you find the stories of Agatha Christie, Black & White (hunted Hunter) and Prison Break ( Alcatraz) exciting and interesting, this tour will offer you an unforgettable time. In this fun escape game a team of 2-7 members will be kept imprisoned in a mysterious room.The participants have to solve riddles and puzzles, find hidden objects and keys, various codes crack to free himself from the room. 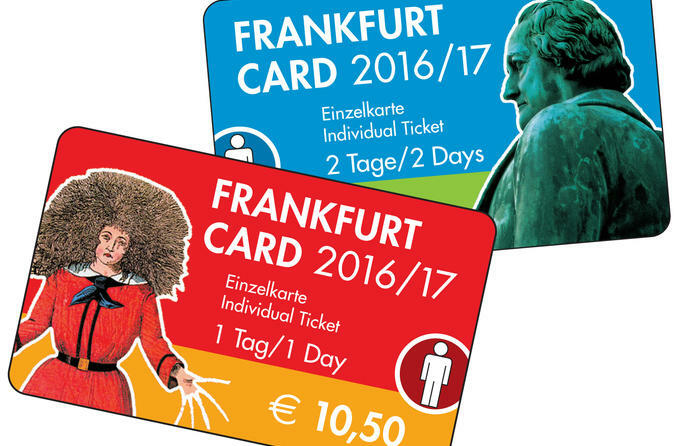 Enjoy a 1-day Frankfurt Card while visiting the city at the Main river. This is the perfect way for Frankfurt visitors to take advantage of the city's well-developed public transportation system as well as enjoying reduced-price admission to numerous cultural attractions and discounts on other services throughout the Main metropolis.